Having spoken to a number of local grocers and traders in our neighbourhood in East London, my husband has found that their highest sales of the year are during Ramadan and Eid, regardless of whether the grocers are Muslim or not. That suggests to me that we can have a lot of influence as consumers. In previous year all of the grocers have stocked dates from a number of countries, but by far the biggest displays are for the expensive medjoul dates and most of the brands I have seen are the ones that have roots in illegal settlements. What really bothers me is the large numbers of Muslims I see buying these without a second thought. I think some will not know of the issues surrounding these. 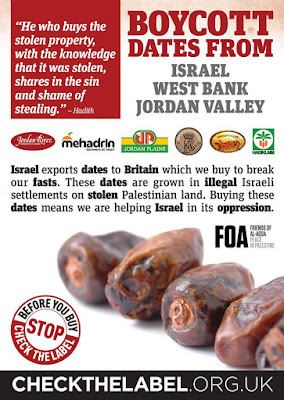 Others will see that they are cheaper than fair trade Palestinian dates and buy them only because of the lower price. 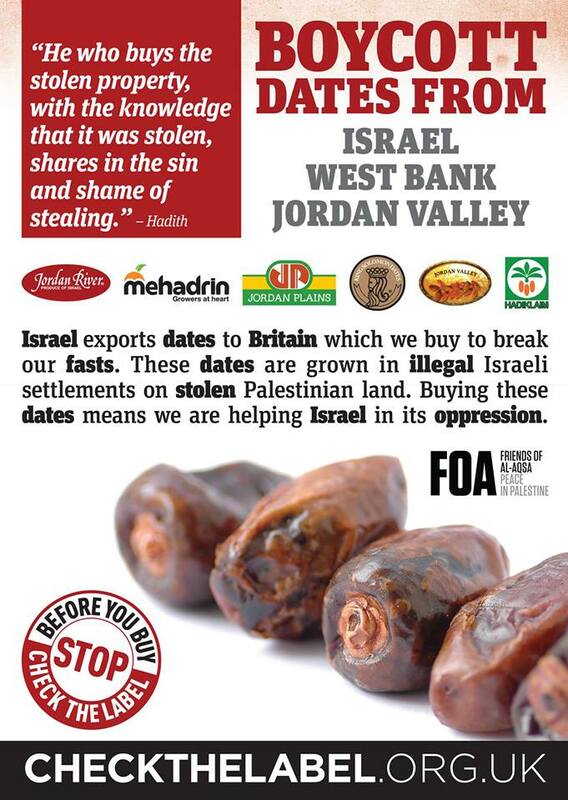 This year I have seen more dates from Palestinian sources appearing in my local shops. 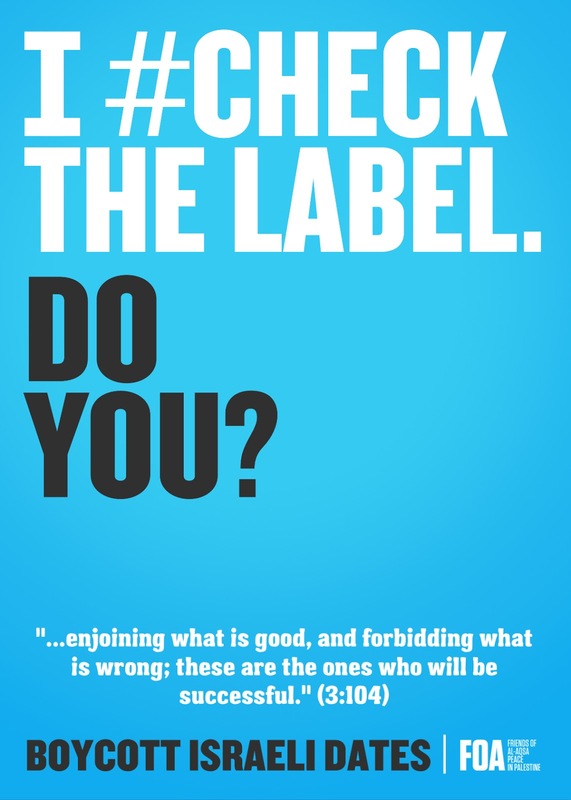 I find this really heartening, I suspect that more people have become aware that where you buy your dates from matters as the #CheckTheLabel campaign has been active in masjids and online provoking discussion and hopefully action. I haven’t seen Palestinian dates in supermarkets so far (although some carry American ones as an alternative and may have dates from Israel that are not from illegal settlements – I have not been able to check). I hope that this year they see a demand for them and start to consider stocking them. 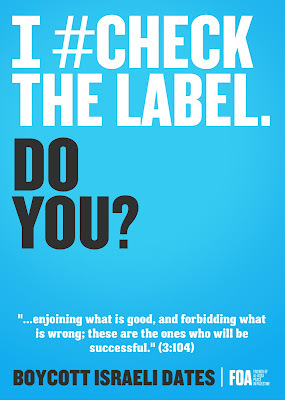 So insh’Allah please lets #CheckTheLabel - I would rather have less, pay more or go without than buy what is not acquired legally or fairly. You can buy Palestinian dates from Yaffa or Zaytoun Fait Trade (please do add any reputable suppliers you are aware of in the comments if you know of any).